Principal Cast : Voices of Chris Sarandon, Catherine O’Hara, William Hickey, Glenn Shadix, Ken Page, Ed Ivory & Danny Elfman. Awards : Academy Award Nomination: Best Visual Effects. Hugo Award: Best Visual Presentation. Synopsis: King of Halloween, Jack Skellington, is tired of the same old holiday, so he embarks on a scheme to take over from Santa Claus and become the new figurehead for the Christmas season. Unfortunately, due to Jack’s inherent “Halloween-ness”, he finds that the spirit of Christmas might not be all he thinks it is. What we think : Well filmed, dark and utterly captivating, Nightmare is one film that’s hard to fit into a specific mold. Is it a Christmas film or a Halloween film? Is it suitable for kids or only for adults, given its dark themes and style? Truth be told, it doesn’t really matter, since the film remains an essential watch whenever Christmas comes around. Superb animation techniques, great music from Danny Elfman, and a kooky, elaborate story from Tim Burton, make this film a genuine, bona fide classic. 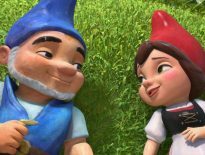 There’s something charming about stop-motion animation, isn’t there? Particularly the kind where an entire film is made with it, just like The Nightmare Before Christmas. Long before Wallace & Gromit took on the Were-Rabbit, Jack Skellington took on the Christmas season and owned it for about fifteen minutes. Skellington, of course, being the king of Halloween, the most un-Christmassy holiday ever devised. From a story by Tim Burton, Hollywood’s weirdest mainstream director, and directed by Burton understudy Henry Salick (who’s debut stop-motion film James & The Giant Peach was a standout! 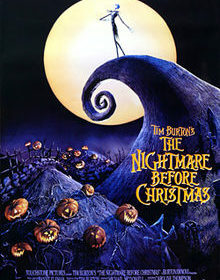 ), Nightmare Before Christmas is a whimsical, lyrical, visual delight. The characters are strange, in the most manic Tim Burton way, and the world they inhabit is equally kooky: but the Halloween-styled Christmas riffs elevate this above simple animated mockery to actual art. Jack Skellington, the depressed and anorexic king of Halloweentown, is fed up with the holiday he’s ruler of. Halloween has lost its charm, so when he sees how happy folks are over Christmas, he decides to steal the holiday for himself. 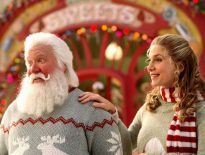 Capturing Santa, devising his own set of Christmassy-halloween versions of the holiday seasons cliches, and proclaiming himself the new “Sandy Claws”, Jack becomes a victim of his own covetousness. The Nightmare Before Christmas is an absolute delight of a film – the animated form is simply stunning with some of the ideas and concepts on display here. How much is Burton and how much Salick had control over is hard to tell, but the film reeks of the formers bristling cinematic stylings and visual themes. Burton’s fingerprints are all over this one, and it’s often led to people mistakenly believing that he actually directed it, instead of just producing the film. Nightmare is a film best described as “disarmingly kooky”, the kind of freaky Burton-esque style that meshes the traditionally Halloween-ish visual elements with an off-kilter child-like fairytale. You can see Burton’s style in films like Edward Scissorhands, Beetlejuice, and in later films like Sleepy Hollow and his updated version of Charlie And The Chocolate Factory, and it’s frame-for-frame visible in this effort. From the set design to the whimsical dialogue and melancholy tones within the narrative, Nightmare Before Christmas is out-and-out a Burton film, brought to life by the keen hands of Salick. The film’s story is effortlessly simple, and in terms of a “kids film”, works a treat. It’s this mix of the bizarre and ghoulish with the magical, bright-shiny Christmas season that brings a smile to the face of even the hardest of cynical hearts, as the morose Jack Skellington develops his devious plan to steal the holiday season. The scripting, of which the majority seems to consist of Danny Elfman’s lyrics set to his moving, rousing music, moves between elation and melancholia, bringing the echoing sadness of creatures destined to forever bask in the dull shadow of Halloween and the possibility that there might be something better for them into the imagination with a realism lacking in so many live action films. Caroline Thompson, credited with the screenplay, really should have shared that credit with Elfman, whose lovely songs also serve to move the story forward – each song Elfman brings to the table never once halts the narrative flow, it builds the characters, the story, the dramatic tension, only so much more beautifully than characters sitting about a table having a chat. Those of you who have yet to fall under the spell cast by this film, I can do little more than once more reiterate my highest recommendation to you. The Nightmare Before Christmas, even with its inherent Halloween flavoring, is a perfect Christmas film with which to fall in love. Beautifully animated, really well designed and structured, and featuring a gorgeous soundtrack by Danny Elfman, you simply can’t go past Jack Skellington’s misadventures in trying to steal the holiday season for himself. Totally agree, Rodney. I'm a big stop-motion fan and this is one of the best examples of the genre. The songs are great too! Ha, I got so excited I couldn't spell my own name right! Now that's strange, I commented and my post (where I'd spelt my name Claier) wasn't even there… Odd! Anyway, I agree that it's a great film and worthy of full marks. The songs are damn catchy and the characters are very unique. I love them all – except Oogie Boogie! @ Claier/Claire – Glad you finally got your name right! LOL!! I hate it when that happens – your original comment got put into my moderation queue because you spelled your name wrong, so I had to approve it before it appeared – the rest of your comments appeard as normal because I've already approved previous comments from you, so that's where the confusion lay! I've made sure everyone can see your amazing inability to spell your own name too, should make for a few people having a larf… 😉 You don't like Oogie Boogie? Man, I thought he was the second best character (After Jack) in the entire film. I love the animation effect on him – it must have been a pain to pull that off. Anyway, thanks for commenting again! I do read your blog too (I don't always comment, I know, but I do read your stuff) and can recommend it to all our readers out there: if you get a moment, check out Claire's material, it's pretty good! She's even written a post about Nightmare Before Christmas too, and you can find it here! @ Will – I think the songs make this film the classic it is. If it had been a more straightforward narrative (non-musical) it might not have been as emotionally powerful. HAHA I cannot agree with you……. MORE!! This is a great film and truly deserving of every star you have awarded it!! LOL!! Yeah, I AM on a Christmas break…. but I can't stay away!!! You are absolutely right that this film casts a spell over you. Good review! @Rodney: Thank you for the link love! I'm glad the mystery has been solved 😛 I will endeavour to spell my name right in the future! Great review Rodney. A brilliant film for sure and definitely deserving of full points! Stop motion animation is one of my favorite types, it's so unlike any of the others and so interesting how they make it work. And of course I must not forget the fantastic music! I love stop motion but I find this film to be too strange. On the other hand I friggin loved Coraline so not sure how that makes any sense at all. Anyway great to hear such love for a film! Couldn't agree more. A true classic. i laughed and cried and at the end, left as a different man. And that was just your review. The movie was pretty good too. @ Steve – Thanks man! @ Matty S – While I can't say I'd like to be involved in making a stop-motion film, being that it takes years and years to film it one frame at a time, I can't help but marvel at the detail and intricacy level involved in such projects. The music is indeed superb. @ Pete – Too strange? I guess it could be seen that way, depending on your acceptance of Tim Burton's frankly often overly dark themes, but I think (since you brought the link up) it is a perfect sister-film of sorts to Coraline – both in terms of narrative and kooky character development. Thanks for dropping by man, hope you had a great Christmas! @ Ruth – Give it a shot, mate. You'll find it's worth it. 😉 And I expect to hear what you thought, of course. @ Dan – Ditto, man. Merry Christmas to you and the wife – may your first as a married couple be blessed with the joy of the holiday season! @ Al – Describing this film as "pretty good" is like describing the Pop as "a little bit Catholic"…. thanks for the kind words as usual, my friend. Can't wait to work on some stuff over at the Bar None in 2012! Hope your Christmas was awesome as well! I ended up watching this about six times between Halloween and Christmas. Jr. just can't get enought of this film. Similarly, he does not care how long the line is at disney we have to wait in the line for the haunted mansion so he can see Jack. I must admit I did not mind watching it over and over with him it just continues to grow on me.